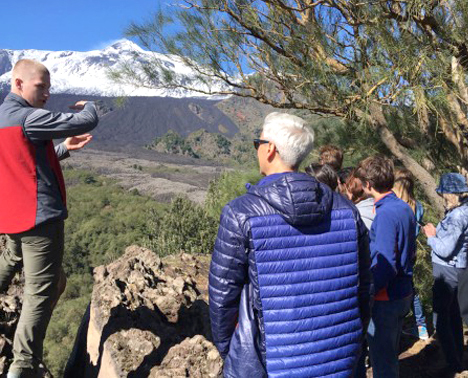 Etna Finder is a tour guiding company that allows people visiting the area to explore the whole Etna region and culture surrounding it. Provide customers with information about the region. Ensure customers are safe and well informed about the dangers of Etna. Lead customers safely around and across Etna’s harsh terrain. Explain points of interest as well as your surrounding environment. Connect the volcanic area with the population of people around it, and explain the advantages and disadvantages of living there. Identify different types of flora and fauna within the region. Passionate about the outdoors and nature. The city of Catania is a relatively big city and you can find almost everything you would do in a major European City. There are a few beaches and of course the Etna Regional Park to explore. There is an abundance of café’s and patisserie’s to get food on the go and numerous amounts of bars and restaurants throughout. Viagrande is a small town/village within the Catania Province it’s well connected with Catania by bus throughout the day and is surrounded by other villages like Trecastagni, Pedara and Aci Bonnaccorsi. If you’re happy to walk around it’s easy to get all the things you need from these villages as well as enjoy your free time.